For years we have searched for the perfect accompaniment to a delicious Max meal. This is our answer: our Family Cuvee is a special blend of only the finest Napa Valley fruit. The five Bordeaux style varietals plus syrah express wild berry aromatics that explode out of the glass and tantalize the palette. The taste is rich with sumptuous tannins and a long warm finish. The wine has a wonderful combination of richness and finesse. Please enjoy it with your favorite cuisine at Max's or with family and friends at home. 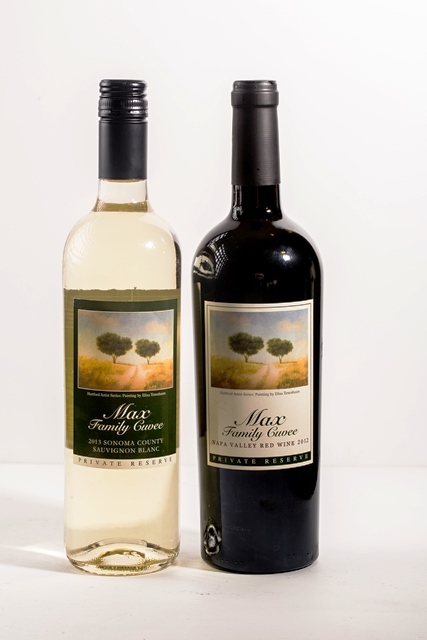 Max Family Cuvee White Blend is carefully crafted in Sonoma, from Sauvignon Blanc, Chardonnay, Viognier and Gewurztraminer to showcase lively citrus flavors, fresh pineapple and a hint of papaya. The finish is bright and crisp with a juicy edge. Wine must be delivered to an address where an individual of at least 21 years of age is available to sign for wines during regular business hours. Only two cases per person every 60 days per Connecticut law. All gift card orders ship via USPS, unless FedEx delivery is selected. For FedEx delivery, your order must be placed by 2 pm Eastern Standard Time Monday through Friday. Orders placed after 2 pm Monday through Friday will ship the following business day. For orders placed on Saturday or Sunday, your order will ship the following business day. For help with plastic gift cards; contact our customer service team at marta@mrgct.com or (860) 566-8360 (8 AM - 4 PM EST, M - F).